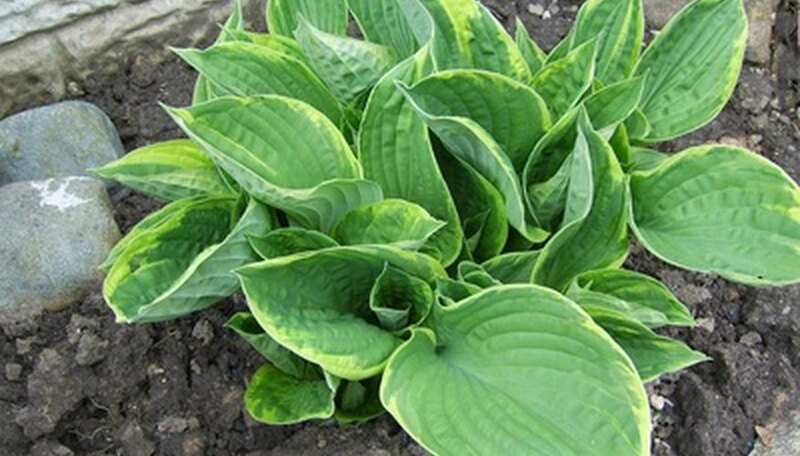 Hostas are hardy plants with beautiful foliage that provide lush boarders and pretty ground covers for beds. Hardy in zones 3 to 9, hostas require little effort to prepare them for the winter season. Apply the last fertilizer application prior to July. Fertilizing in late summer may encourage new growth and prevent the plant from preparing for dormancy during winter. Cut the stalks of all spent flowers back to the crown of the plant. Remove yellow, wilted, or dead leaves. Rake leaf litter and dead material out from under and around the plant. Slugs, pests and diseases love to hide in decomposing material. Apply a thin layer of mulch carefully in the fall. Wait until several hard frosts have occured, freezing the ground to about 3 inches deep. Remove mulch from around the crown as soon as the soil begins to thaw, or you may provide a home for pests and conditions ripe for crown rot. Fertilize hosta plants in the late winter or early spring, before they break the soil. Use a slow-release fertilizer, such as a 13-13-13 mixture. Water the hosta well to distribute the fertilizer and wash any granules off the leaves. Follow up with a water-soluble fertilizer after the hosta’s leaves emerge. Add well-seasoned manure to the soil, if desired. Wait to fertilize newly planted hostas until they have put out new roots, or use a time-release fertilizer immediately after planting. Get a soil test to determine what nutrients are lacking in the soil where the hostas grow. If the soil test indicates the soil has sufficient amounts of the necessary nutrients, then all the hostas will need is an application of compost each fall. If nitrogen or other nutrients are lacking, however, proceed to Step 2. In early spring, when hosta leaves are emerging from the ground, mix the required fertilizer according to package directions. Apply fertilizer solution on soil surrounding each plant, but make sure you do not get fertilizer on the plant itself. Water the plants two to three times within the week following fertilizer application, to ensure the nutrients go down into the soil where the roots can access them. Repeat the fertilizer application and subsequent watering six weeks later, or just before flowers emerge. Cover tender hosta shoots if an early spring freeze is forecast. Anything that will protect the hosta will work, such an upside-down laundry basket or garbage can, or a blanket, towel or sheet. If necessary, install stakes in the soil to prevent the cover from touching the leaves. Remove the protective cover as soon as the temperature warms up in the morning and climbs past the freezing mark. Re-cover the hosta in the evening if the cold snap is predicted to last another night. Prepare hosta plants for winter with a 3- to 4-inch layer of organic mulch such as straw, bark mulch or pine needles. Mulch is most important for hosta plants during their first two to three years, as the mulch will protect the plant from damage caused by freezing and thawing. Allow seed pods to form on hosta plants. Collect seed pods by cutting the entire flower stem when the pods turn brown and begin to split open. Dry the seed pod by placing the entire stem into a brown paper bag and suspending it in a cool, dry, dark room. Break the pods open when the seeds are dry and plant them in sterile seed starter soil in clean seedling trays. Since only one in five seeds will germinate, plant the seeds close together. Mist the trays with water and cover with a plastic cover. Store in a dark room that is between 60 and 70 degrees F. The seeds should germinate in 2 weeks time. Continue to mist to prevent drying. Move the tray under fluorescent lights when they begin to sprout. Wait until all chance of frost has passed and transplant your hosta sprouts directly into the garden soil in a shady to partly shady location. Mulch the seedlings with a ¼ inch layer of sand to discourage mildew. Water with a soaker hose. Never water from above the plant as this could cause the plant to mildew. Fertilize the plants with a 10-10-10 fertilizer after the third leaf has emerged. Cut away any damaged or diseased leaves. Cut the leaf and stem off at ground level. Dispose of damaged plant material in your compost bin. Do not place diseased plant material in your compost bin. After pruning diseased plant material, disinfect your pruning shears by dipping them in bleach or alcohol. This can be done at any time during the growing season. Prune away the spent flower stalks. This should be done once the flowers give way to green seed pods. The seed pods will only drain the plant's energy and their removal will also improve the appearance of the hosta plant. You can deposit the pruned plant material in your compost bin. Cut back the foliage to the ground in the fall after it has died back, usually after the first hard frost. Place a layer of mulch over the plant bed. You can use mulched leaves, straw, hay or evergreen boughs. Clear away any dead leaves, old mulch, or other debris from the area of your hosta once you can see the tips of the new plants coming up from the soil. Use the rake carefully around the plant so as not to gouge or pierce the fragile hosta tips sticking up from the ground. Apply equal parts nitrogen, phosphorus and potassium fertilizer such as 10-10-10 to the plant according to the directions on the packaging. The dose, method of application, and the frequency of treatment should be listed. Spread a 3- to 4-inch layer of fresh mulch around the base to hold the fertilizer in and keep weed growth down. As you work the mulch, make sure you don’t cover over the new hostas, which may still be quite short. Repeat adding the feed to your hostas as frequently as the manufacturer’s instructions state until midsummer, when fertilizing should stop. Choose a site with good drainage and filtered sun to full shade. Work the soil to a depth of about 1 foot. Add organic matter to the soil and mix well; hostas require a rich medium to grow their prized foliage. Dig a hole about 1 foot deep. Make sure the hole is wide enough for the roots to spread out comfortably. Prepare to plant bare root hosta starts by making a small hill of soil at the bottom of the hole. Gently spread the roots out over the mound, ensuring that the foliage base rests right at soil level. Fill in around the roots and firm the soil. Remove hosta plants from their container and loosen the roots, separating any clumps. Gently shake excess soil from the roots and spread them out in the hole. Back fill the hole and firm soil. Plant hostas 1 to 3 feet apart to allow for mature growth. Water the freshly planted starts. Carefully monitor hostas for adequate hydration, especially if they are planted near trees or shrubs that will be sharing the water supply. Apply a balanced, slow release fertilizer when planting, typically in early spring or fall. Always fertilize at the base of the hosta and never over the leaves; fertilizer can burn or damage them. Foliage ranges from 6 inches to 3 feet in height with many different colors, leaf textures and leaf shapes. Hostas can have lily-like flowers on stalks, ranging in color from blue to green to purple to white. Hostas prefer to grow in shade with some morning sun. They are drought tolerant, but do best with regular watering and summer mulching to retain moisture. Soil should be near neutral in pH. Most hosta varieties do fine in USDA hardiness zones of 3 (for example, Wisconsin and Montana) to 9 (for example, Texas and Florida). To propagate a hosta, divide and plant its root clumps. Early spring is the best time. Divide once every three to five years for the health of the plant. There are now over 100 hosta societies. The American Hosta Society is one of the best known. Deadhead the hosta plant. Cut off the hosta's flower stalk as soon as the flowers have withered. This encourages the hosta to continue to produce new flowers. Prune back the hosta plant to prepare it for winter. Wait until after the first frost in your area when the hosta plant starts wilting. Use a ruler and measure 6 inches from the base of the plant. Trim back all foliage beyond the 6-inch mark. This helps keep the plant from being burned severely during the winter's colder temperatures. Pile mulch or hay over the plant after trimming it. Clear away any damaged leaves by gently tugging away the yellow or brown leaves or clipping them off as close to the base as possible. Place any removed leaves in a garbage bag to dispose of them. Only put discarded leaves in a compost bin if you are certain your damage is from insects or other animals and not from disease, fungus or bacteria. Apply any fungicide or insecticide to the remainder of the plant as needed following the dosage and application method given on the label. Monitor your hosta as it recovers from the damage. Water your plant if your area is receiving little rain. Dig up severely damaged hostas and plant them in a pot or container to isolate them from the rest of the garden. Nurse the plants back to health through watering, fertilizer and mulch when needed. Do Hostas Need to Be Cut Down? Why Aren't My Hostas Flowering?